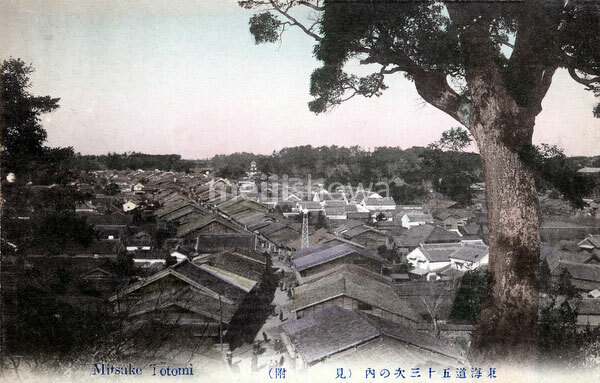 Panoramic view of the Tokaido at Mitsuke-juku (見附宿). Located in what is now Iwata (磐田市), Shizuoka Prefecture, Mitsuke was the thirty-second of the fifty-three stations of the Tokaido. The name means “with a view,” because it was the first place from which Mount Fuji could be seen by travelers coming from Kyoto. Totomi (遠江国, Totomi-no kuni) is the old name for what is now western Shizuoka Prefecture.